Time for a confession. Before the start of this year I had never heard of a Brown Argus. I didn’t know that it was a butterfly. How bad is that. Moreover, I saw them in the results for the Wider Countryside Butterfly Survey, and assumed that they were a specialist that I would never see. I saw pictures on Facebook and then thought nothing much more about them. In fact I wasn’t sure I would recognise one if I saw it. Yesterday I took my camera out for a walk – for once the weather was warm and not very breezy. 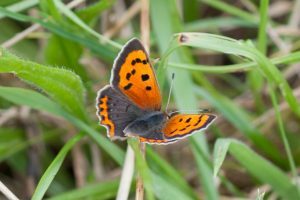 I saw a lot of gatekeepers, a very lovely small copper – a butterfly that I had never seen in Daventry before. I also saw some common blues flitting about the field edges. Lots of photographs were taken as you can probably imagine. Today I decided to upload them and sort out the fuzzy from the sharp as well as those that might not be the best, but could be useful for ID purposes. 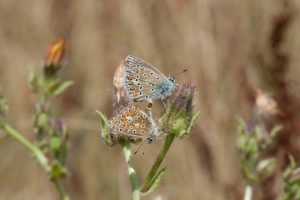 After I had sorted and tagged them it occurred to me that I had assumed that the small brown butterflies were common blue females (which have wings that vary from blue through to brown) because they had frequently been disturbed by blue males. 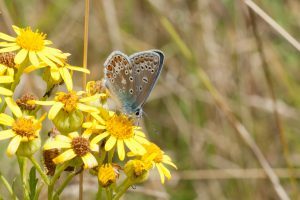 But, for some reason I thought I would see what the difference was between a brown argus and a female common blue. 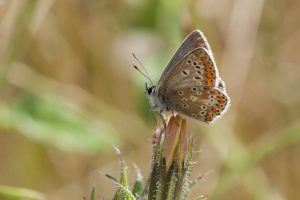 A brown argus has no blue on the upper side of its wings, whereas there may be some blue scales on the female common blue. 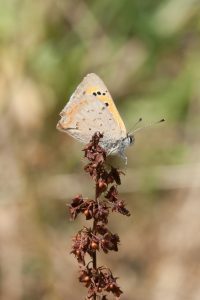 It also has more orangey spots along the edge and often a dark brown spot in the middle of its brown wings. Not much help because my photos were all of the underside of the wings. 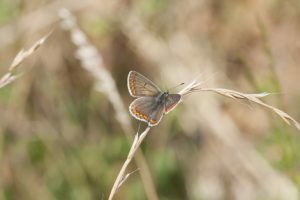 So, for the undersides the description was related to two spots with that form a figure of eight on the hindwing and the absence of a spot on the forewing for the Brown Argus. This didn’t seem to be much help either – I was a bit non-plussed until I saw what they were talking about in pictures on the UK Butterflies website. Suddenly I knew what to look for and guess what? 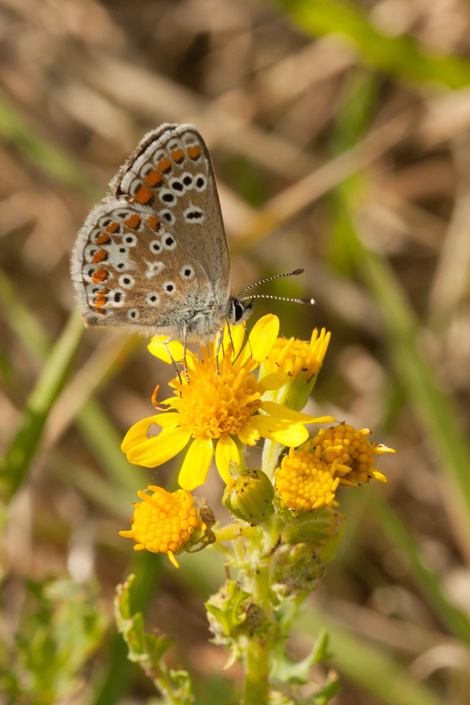 Yes, one of the butterflies I photographed was in fact my very first Brown Argus – colour me happy! I’m not sure if this is a viable population as my Northamptonshire butterfly book states that their range has contracted a lot in the county and that their traditional food plant is rock rose and, where this is not available, they have moved onto crane’s bill. Unfortunately the only things I could see around the field edge were ragwort and a chamomile, along with lots of grass. I will have to have a look around there to see if I can find the requisite flowers!